Members of the Meigs County business community and numerous individuals contributed to the University of Rio Grande and Rio Grande Community College scholarship during Friday evening’s Chamber and Tourism Spring Dinner and Auction. 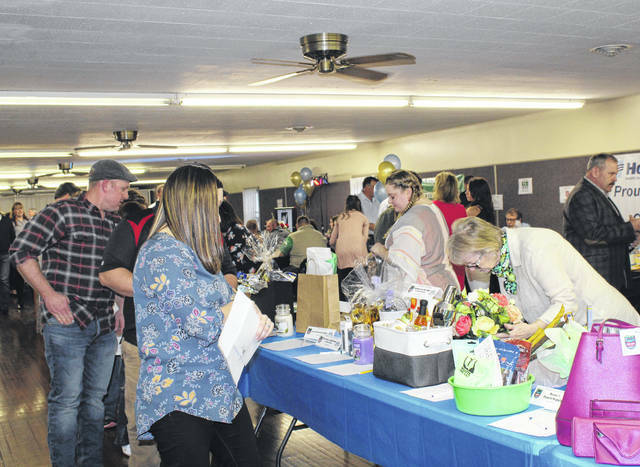 More than 100 live and silent auction items were up for grabs as part of the annual Meigs Chamber and Tourism Spring Dinner and Auction. This Meigs County cake by MyCakes was one of the auction items available Friday evening. Mony Wood models one of the live auction items during Friday’s Chamber and Tourism Spring Dinner and Auction. 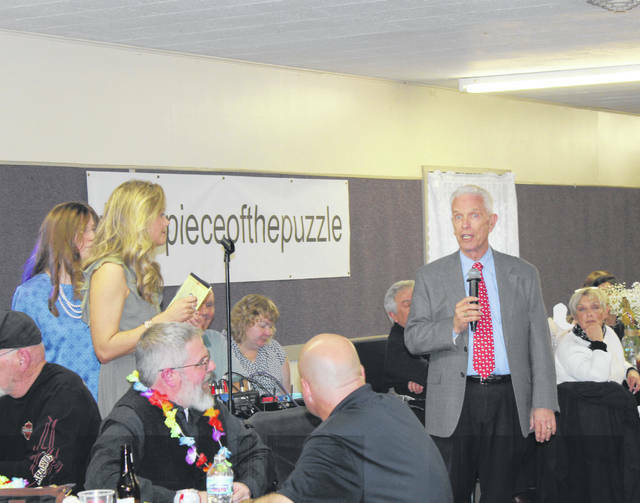 Congressman Bill Johnson spoke briefly at the dinner on Friday evening. RACINE — A capacity crowd made for a lively and exciting evening on Friday at the annual Meigs County Chamber and Tourism Spring Dinner and Auction held at Kountry Resort Campground. The event featured a dinner of steak, chicken or salmon prepared by the Chamber Grill Team, which was served by members of the Past, Present and Future Meigs County Fair Royalty and advisors. 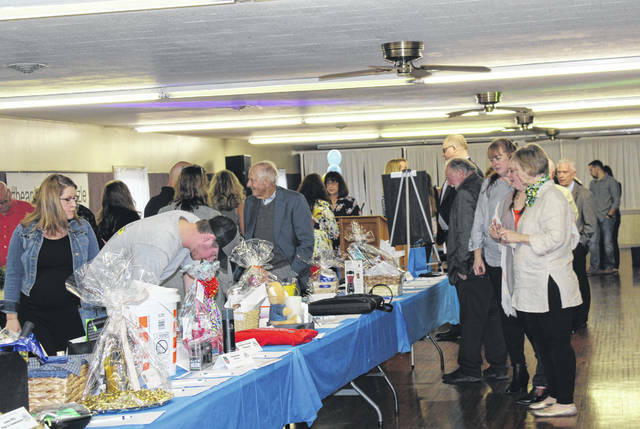 There were a total of 95 silent auction and 15 live auction items donated by local businesses, individuals and organizations for the event. 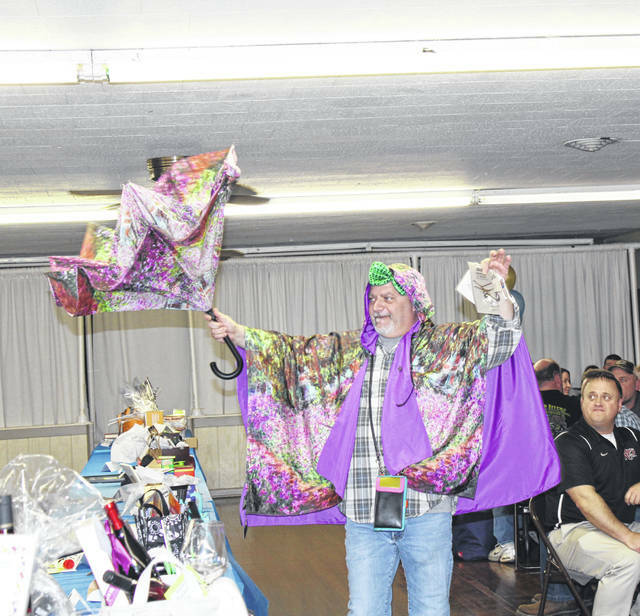 Ohio Valley Bank’s Dan Short served as the auctioneer, with several assistants modeling and presenting the available auction items. One of the largest auction items each year continues to be the University of Rio Grande room and board scholarship. Each year at the spring dinner and auction local businesses and individuals contribute to the scholarship which is then awarded to a Meigs County graduate to pay for their first year of room and board at the University of Rio Grande campus in Gallia County. Combs read an update from the 2018 scholarship recipient Hanna Bottomley, a Southern graduate, which was shared by the Chamber earlier this year on their Facebook page. I have finished up my first semester as a college freshman with a 3.6 GPA as well as being on the Fall 2018 Merit Honors List! I’ve also pledged and been initiated into a sorority, Zeta Theta Chi, where I am the Vice President. I am also the secretary in the Rio Gaming Organization and Secretary in the All Greek Council. I’ve made many friends as well as had time to focus on my classwork due to not having to take time out of my day to commute everyday. I’m still so thankful for this amazing opportunity I had been given and I believe without it, my life with be completely different right now. So again, thank you so much for allowing me this and I’ll forever be grateful. The scholarship will be awarded later this spring to a 2019 graduate from one of the local high schools. In a new twist this year, each table was decorated by a different table sponsor with unique items, centerpieces and gifts to represent their business or organization. Each centerpiece was then sold at silent bid, with attendees leaving with flowers, cakes, wine, and many other unique centerpieces. “We are so grateful to our Chamber members, business community, elected officials, individuals from the community, our event sponsors, ambassadors/volunteers, and everyone else who played a part in making this year’s event a huge success,” said Combs. The event was made possible thanks in part to many sponsors including Elite Community Partner Chamber Members Farmers Bank, Univeristy of Rio Grande/Rio Grande Community College and Holzer Health System. Combs is working to compile an album of photos from Friday’s event. Anyone who would like to submit a photo may email it to director@meigsohio.com. While the dinner and auction are over, one of the promotions is continuing — 200 Years, 200 Envelopes. Participants have the opportunity to win up to $9,000 in prizes, including $5,000 cash, or one of four prize packages from local businesses. A few envelopes are still available for purchase by contacting the Chamber. The drawing will take place during the Meigs County Bicentennial Celebration on April 27. The chamber is looking forward to their next event on July 19, which features a night golf scramble. Other events planned for 2019 include Corks for a Cause on Sept. 7, the annual awards gala on Nov. 2 and the member Christmas Open House in December. Additional events, including Lunch and Learn and Business After Hours events will be announced at a later date. The Chamber also hosts a weekly Chamber Chatter each Friday at 8 a.m. at the Chamber office. New for 2019 are several levels of Chamber membership, including Community Connector, Bridge Builder, Community Investor, Visionary Partner and Elite Community Partner. Each level comes with different benefits and sponsorships of Chamber and community events throughout the year. Those interested in becoming Chamber members or who still need to renew their membership for 2019 may contact the Meigs County Chamber and Tourism at 740-992-5005 or director@meigsohio.com. 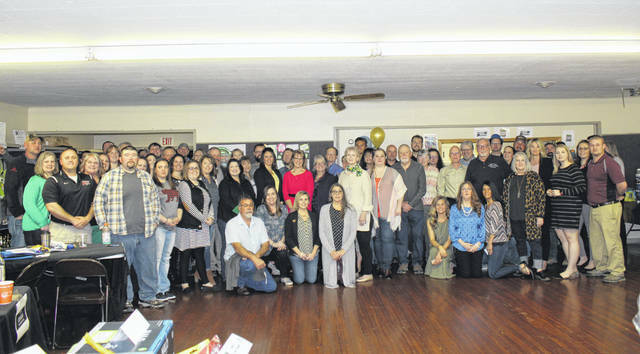 https://www.mydailysentinel.com/wp-content/uploads/sites/14/2019/03/web1_3.20-Chamber-1_ne2019319152126339.jpgMembers of the Meigs County business community and numerous individuals contributed to the University of Rio Grande and Rio Grande Community College scholarship during Friday evening’s Chamber and Tourism Spring Dinner and Auction. https://www.mydailysentinel.com/wp-content/uploads/sites/14/2019/03/web1_3.20-Chamber-2_ne2019319152128472.jpgMore than 100 live and silent auction items were up for grabs as part of the annual Meigs Chamber and Tourism Spring Dinner and Auction. 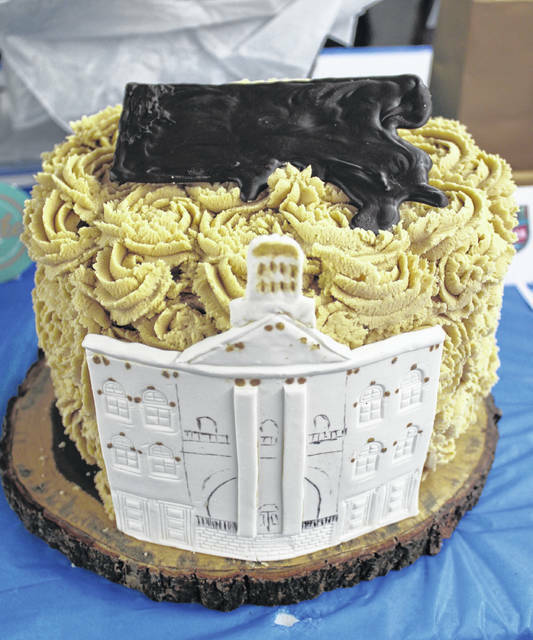 https://www.mydailysentinel.com/wp-content/uploads/sites/14/2019/03/web1_3.20-Chamber-3_ne2019319152130894.jpgThis Meigs County cake by MyCakes was one of the auction items available Friday evening. https://www.mydailysentinel.com/wp-content/uploads/sites/14/2019/03/web1_3.20-Chamber-4_ne2019319152133953.jpgMony Wood models one of the live auction items during Friday’s Chamber and Tourism Spring Dinner and Auction. https://www.mydailysentinel.com/wp-content/uploads/sites/14/2019/03/web1_3.20-Chamber-5_ne2019319152137291.jpgCongressman Bill Johnson spoke briefly at the dinner on Friday evening. https://www.mydailysentinel.com/wp-content/uploads/sites/14/2019/03/web1_3.20-Chamber-6_ne2019319152139548.jpgMore than 100 live and silent auction items were up for grabs as part of the annual Meigs Chamber and Tourism Spring Dinner and Auction.